We are happy to answer your questions about our teeth whitening service. Tooth whitening enhances the brightness of natural teeth. We offer two options for whitening your teeth. Opalescence® which is a take home whitening system and ZOOM!® which is a combination in-office procedure and take-home procedure. Dr. Kokinias can discuss the options with you and help you determine which is best for you. Patients with infected gums or decay on their teeth should schedule treatment to eliminate these conditions first and then discuss whitening options. Also, a bridge, crown, veneer or other restoration cannot be whitened. If you would like a whiter appearance to these restorations, they will need to be replaced. The lifespan of whitened teeth can range from 6-12 months, depending on the type of treatment used and your consumption of food and drink that can easily stain teeth (such as blueberries, coffee, tea, soda and red wine). Patients may need to “boost” and re-apply whitener to their teeth several nights every year to maintain the desired level of brightness. Tooth whitening is an affordable and effective way to combat common causes of tooth discoloration while boosting your self-confidence and improving your appearance. The Opalescence Whitening System uses custom-made trays that you wear overnight or for as little as 3 hours. Prescription-strength Opalescence Tooth Whitening System is stronger and more effective than over-the-counter teeth-whitening products, and are only available through your dentist. We have a large variety of Opalescence Whitening products to offer our patients. With Philips Zoom in-office whitening, you can whiten your smile up to 8 shades whiter in just 45 minutes. The biggest benefit of ZOOM!® is that you get outstanding results with little to no sensitivity. In-office tooth whitening gives you immediate results and, because your treatment is offered through a licensed Dentist, you can be assured your treatment is safe and produces expectable results. 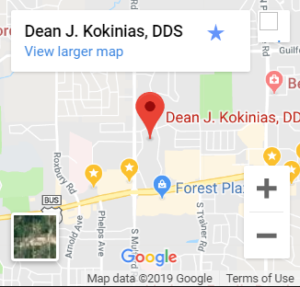 In addition, Dr. Kokinias provides patients custom take home trays which are included in the price of the in-office procedure. This guarantees that you can continue to maintain the wonderful white smile you want. Just purchase additional gel at your regular dental check ups to touch-up your whitening as needed.